First bakery experience. With one of my brilliant adult classes. <3 There were six of us and between us we shared seven slices of cake. 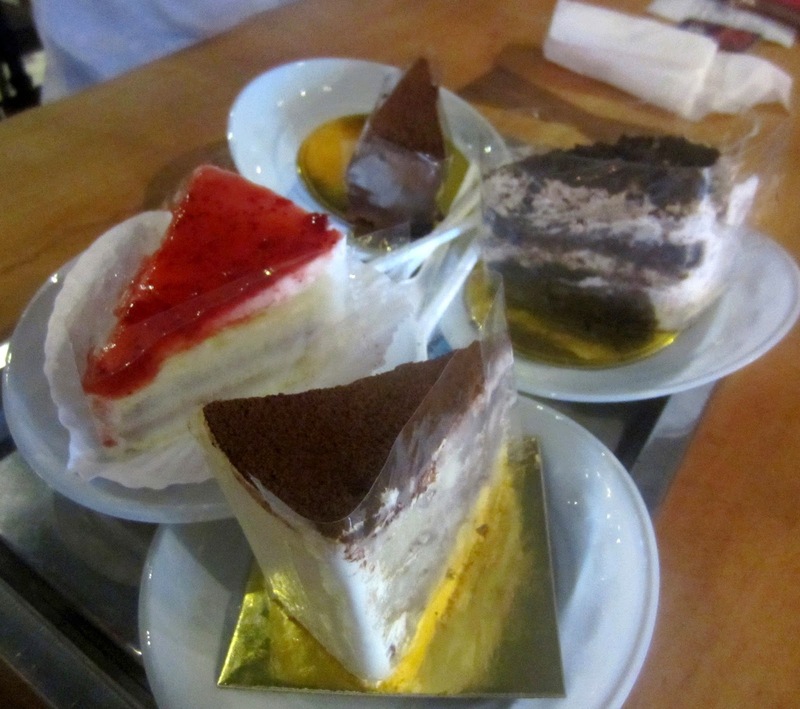 Tiramisu, cheese cake, chocoholic cake, some other lovely chocolate cake, and the best was, yet another, chocolate cake called Marula I think? Not quite sure what it was, but very scrumptious. 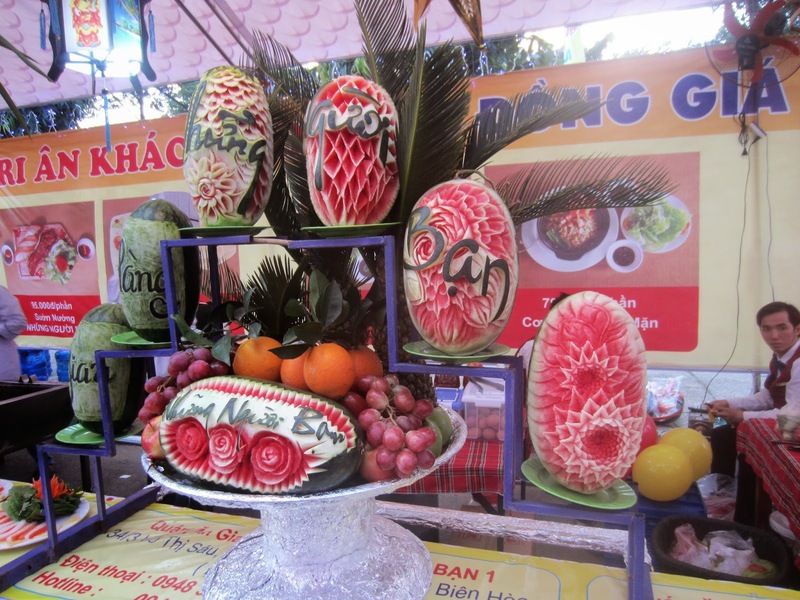 I was actually quite surprised discovering this whole bakery-culture – I was under the impression the Vietnamese aren't the biggest cake-eaters. Well, maybe they're not the biggest dessert-eaters is more like it. Anywise, loved the bakery. First Westerner-sighting. !!!! 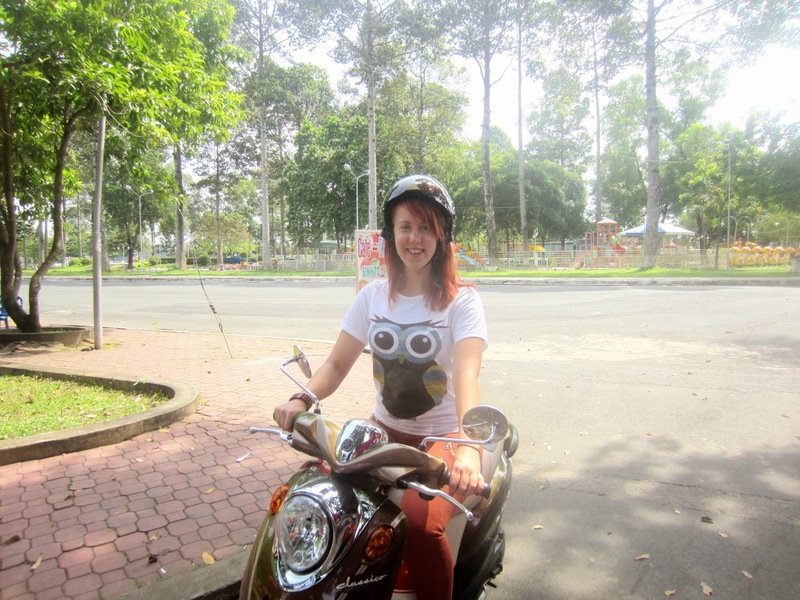 In Bien Hoa that is. Were at our 'local' bar but this time on a Monday not the usual Sunday, and some English teachers from another school were there too playing pool! 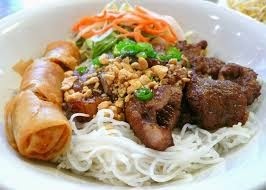 Ok, I complain about the Vietnamese staring at Westerners, but OH MY GOSH how I cannot blame them, I mean, a WESTERNER, such a RARE breed I was in awe! Didn't chat to them then, but bumped one of them later on our ROOFTOP POOL (have I mentioned our ROOFTOP POOL yet? Well, now I have.) 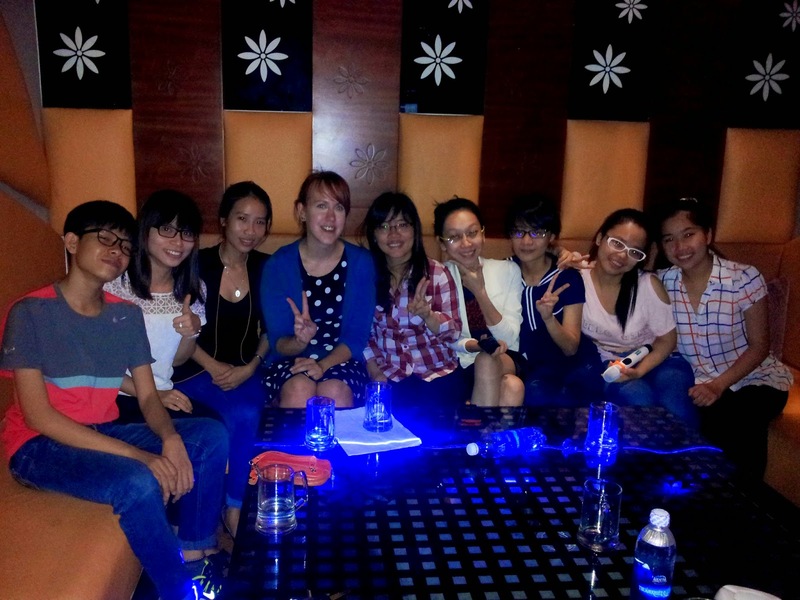 which was well cool – my company's teachers are not the only foreigners in Bien Hoa. First dress-shopping. It is not the funnest thing in the world getting half-naked in a corner of a random clothes shop with a random curtain pulled across you which keeps massively flapping away due to the fan. In some shops the assistant superkeenly would randomly enter your personal space mid-change and help you with the zip or something. 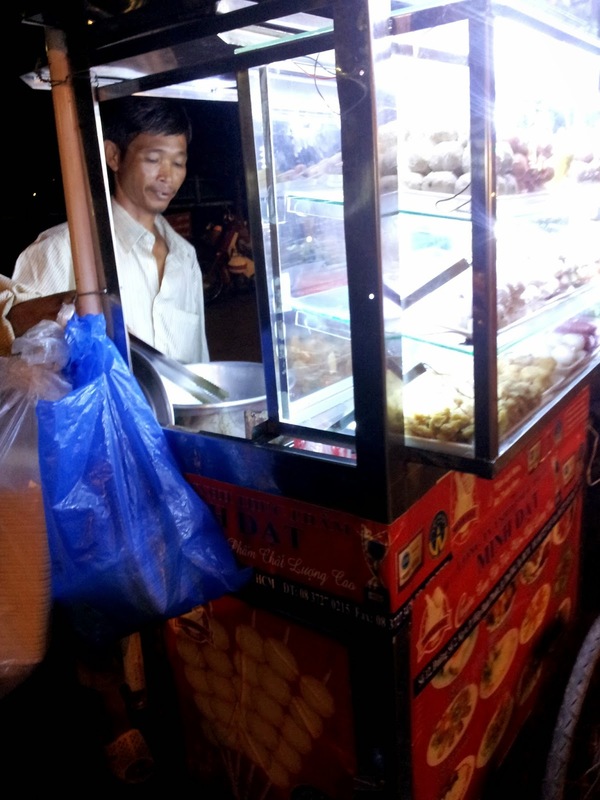 Also, one night had a dinner of street food – little men (or women) behind their little wheely stalls with various balls of funky meat, spring rolly-type things, sausages and general snacky food. 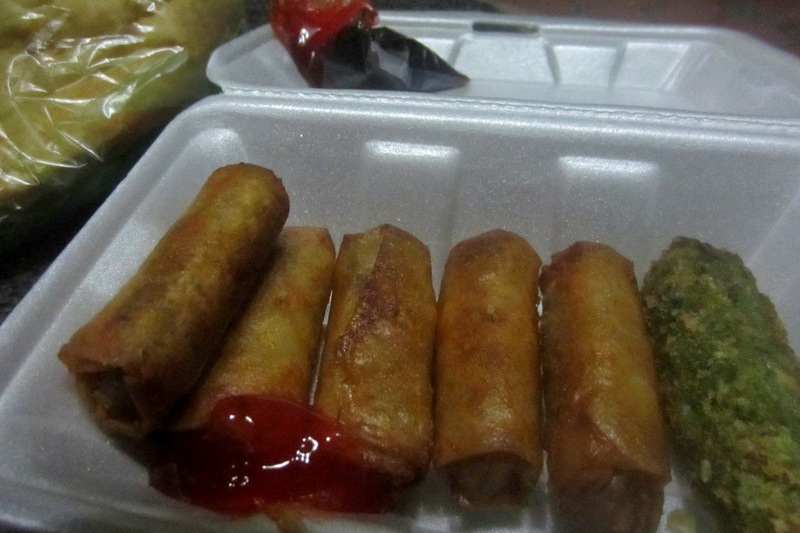 Had spring rolls and an exciting green thing which turned out to have some sort of cheese in it, om nom! First hairdressers. It finally came to the time that I could no longer ignore my roots, plus, next week is the above-mentioned super-glam CHRISTMAS PARTY which one absolutely cannot attend with rooty hair. But, do I trust Vietnamese hairdressers? I decided to. One of my favourite Vietnamese people H, who works at my school, took me to her local hairdresser. 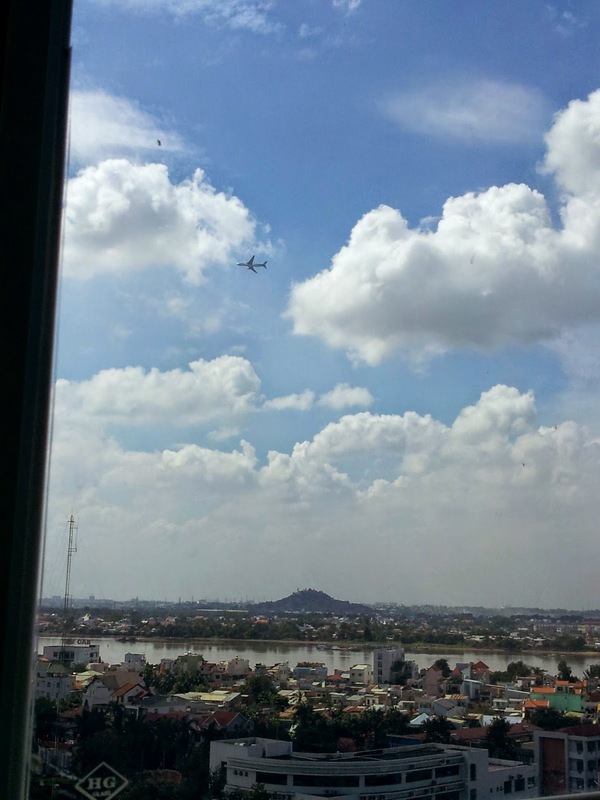 Now, in Vietnam you should know that there are usually at least three people doing a job I am used to one, max. two people doing. Well, here, at the best of times I had four people doing my hair. One holding, one putting the colour, one doing something else. Or, well, drying hair is quicker with two people and two hairdryers eh! So how did it turn out? STUNNING. Dep lam, very beautiful. I have rarely been that pleased after a hairdressers. Even my fringe has never looked so glam before, and as exactly sidey and as exactly fringey as I wanted!!! They were lovely. I had Mr Sleek and Silent, Miss Lovely and Mr Cheery who, for the whole two hours looked as if he had just gotten out of bed – still in what I am pretty sure were boxers, and his hair constantly floppy and bed-haired. 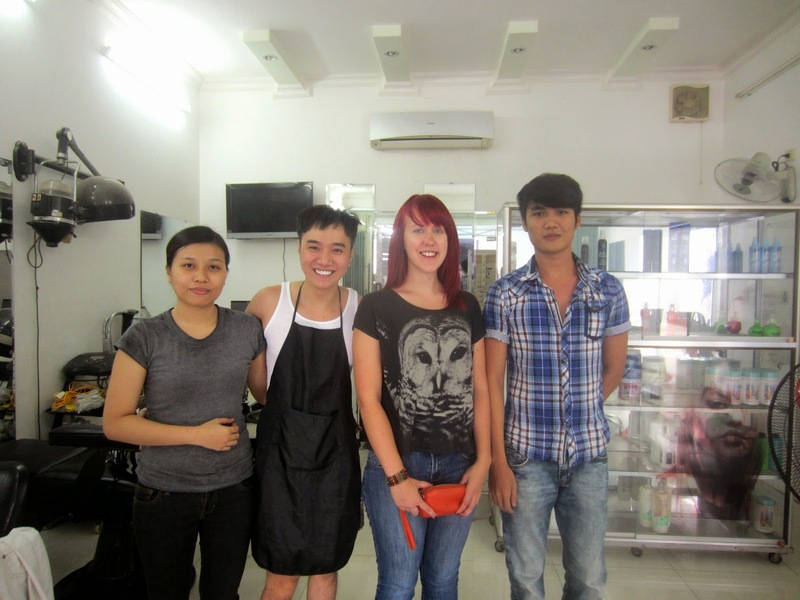 (Try and see if you can identify them from the pic...) But that didn't lessen the charm, I loved them and I would like to think they had fun doing my hair – I doubt dying hair red is on their everyday agenda, this out-of-the-way hairdresser in an already out-of-the-way Vietnamese town. More Vietnamese words. Especially at the hairdressers H taught me a lot of Vietnamese, she is a brilliant teacher. For example, 'side fringe' is 'mái xéo' (literally 'fringe sloped'), with the intonation going up. (Though, easily to be confused with 'mai xèo' which would translate as 'tomorrow pancake'.) “So 'xèo xéo' would mean 'sloped pancake'?” I asked H over lunch. “You are intelligent,” she said, but then told me that it doesn't actually exist. First notebook. Because how can you NOT buy something with SUCH a powerful message. Climatal adaptation. Hahahaha no just kidding. You don't ADAPT to this climate. You just learn to avoid it at its most scorching heat. First funky watermelon. And when I say funky I mean funky. Ok, there are a few milestones for the time being. Kiva että tykkäsit, en oo vaan vielä keksiny tarpeeks syvällistä täytettävää sille :( Kiitos! 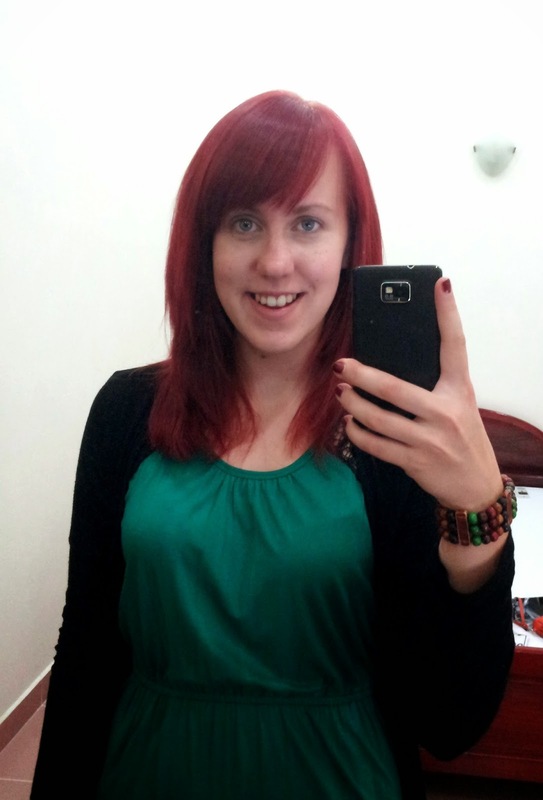 If Westerners are such a rare breed, how rare is a red-haired Westerner?!? Speaking of which, I guess we shouldn’t tell Marita downstairs that she’s been outclassed by a Vietnamese man in boxers and unkempt hair and his three colleagues… I guess he dressed up for the photo and donned an apron. Don’t be so ungrateful. You have woolly socks – enjoy using them. I slave away, overworked and underpaid, doing the best I can. I’m not simplistic like Fan. I’m a complicated and complex being. Take time to understand me. I should warn you, though: I do like to be unpredictable, and if I want to blow hot when you want cold and blow cold when you want hot, then you just need to get used to living with me. I’ve been in this hotel room longer than you, and I expect I’ll stay here long after you’ve gone. You've actually behaved better recently...ish. I also took special notice of the woolly socks, like Air Con did. I'm glad a pair fitted in your suitcase! 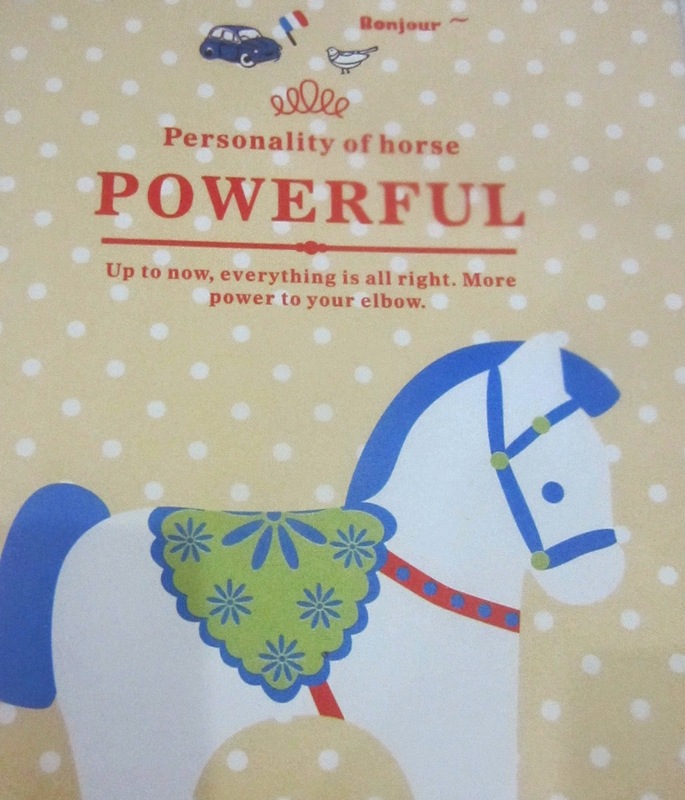 And like Hanna I loved the horse notebook with its philosophical message. Did the hairdressing young man put the apron on specially for the photo? You will soon speak Vietnamese fluently, I gather. :) How are the tones coming on?